Hard Rock Cancun is on the most incredible beach! This compact property is small enough to feel comfortable and cozy, while still being large enough to keep guests as busy as they want to be. 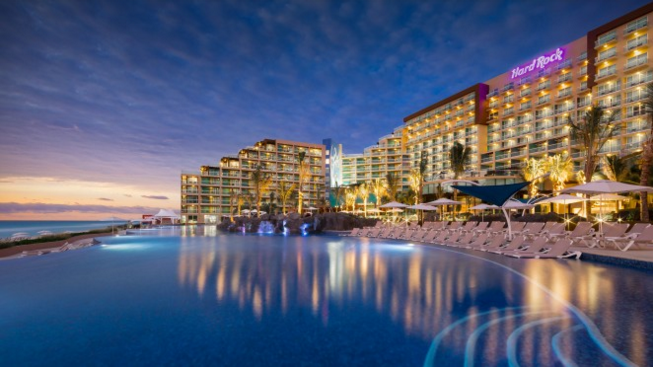 Located just 25 minutes from the Cancun airport, Hard Rock Hotel Cancun is flanked by the Caribbean Sea and the Nichupte Lagoon, just a short stroll from all the attractions in Cancun’s famous Hotel Zone. Relax in the sunshine or dive into a lively and active vacation. The property's Signature Inclusive Luxuries make it easy for you to enjoy anything you want, whenever you want it – fine dining, premium wines and spirits, water sports, nightly entertainment – without hesitation. Say "I DO!" with Romance Travel Group! Call 507-267-4857, Email or Sign Up today! Copyright 2016 Shelli’s Travel, LLC. All Rights reserved. Users of this site agree to be bound by the terms of Shelli’s Travel Terms and Conditions. CST# 2123738-40, Washington UBI #603 569 955, Registered Iowa Travel Agency TA#1273. Shelli’s Travel materials (including, but not limited to, names, trademark, service marks, logos, marketing materials, etc.) shall not be used, reproduced, transmitted or distributed in any way, except with the express written consent of Shelli’s Travel.